Check out these fun, and at times a bit wacky, first grade geometry worksheets. Sorting shapes with two attributes are the order of the day (more are to come in the near future!). Choose the shape or shapes that have two qualities (attributes) in common. For instance, circle the shapes that are both red and round. Or put an X on the shapes that are green and have dotted lines. 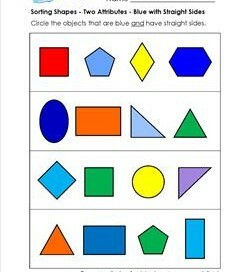 Any way you slice it, you’re kids are bound to have fun with these simple, and even a bit more challenging, worksheets. Please go to this page to choose from all the geometry worksheets on this site. Sorting shapes can be loads of fun! Just pull up this page of two attributes – blue with straight sides – and get cracking! 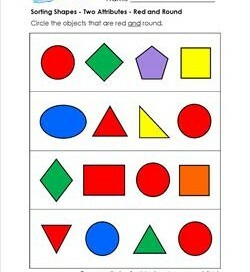 A sorting shapes worksheet with two attributes just rolling on by in cheery primary colors. Circle the shapes that are both red and round. 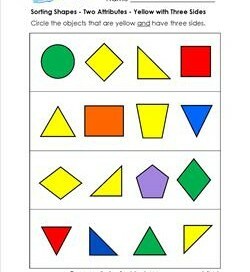 In this sorting shapes worksheet look for and circle the the bright yellow shapes that have three sides. 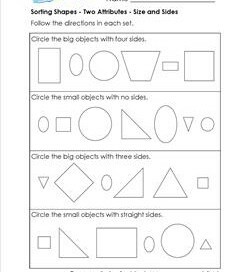 In this sorting shapes worksheet children follow the directions in each of the four sets to find the two attributes – shape and size. 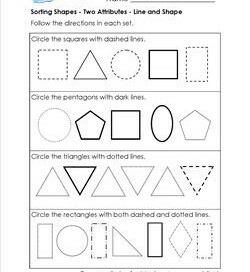 This sorting shapes worksheet with two attributes – size and sides – is another great way to practice sorting skills. 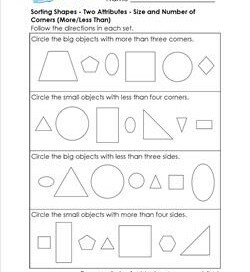 In this sorting shapes worksheet kids look for big or small shapes and circle the ones with the specified number of corners (vertices). 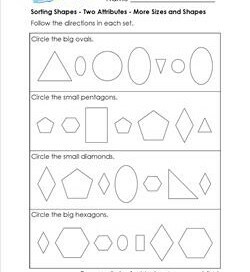 This sorting shapes worksheet takes the types of shapes a step further. Sort pentagons, diamonds (rhombuses), hexagons, and ovals. 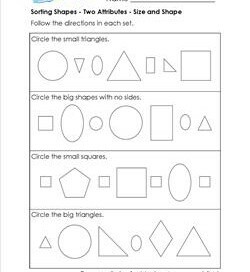 Things get a little wacky in this sorting shapes worksheet! Find the shapes that are made of bold lines, dotted lines, or dashed lines. 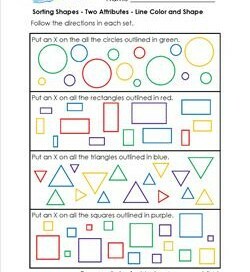 In this colorful sorting shapes worksheets kids put an X on the circle, square, rectangle, or triangle of the specified color.